Ever feel like you need superhuman strength to unbuckle your kiddo’s car seat? (The struggle is real!). 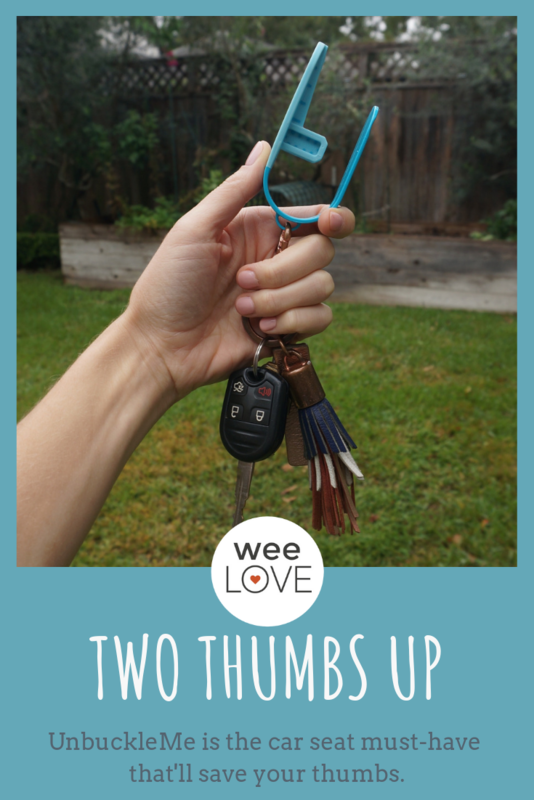 Thanks to UnbuckleMe, all you need is a light squeeze to spare your thumbs and pop open a rigid car seat buckle. This genius little gadget (made in the USA from BPA-free plastic) reduces the force needed to unlatch that pesky red car seat buckle by more than 50 percent by simply using leverage. Developed by a mother-daughter duo (Grandma is an occupational therapist; Mom is a Child Passenger Safety Technician! ), UnbuckleMe can be quickly clipped onto most car seat buckles for use when it’s time to get out of the car quickly and easily. Be sure to keep your UnbuckleMe within *your* arm’s reach (think: seat pocket, diaper bag, or on your keychain) so you can grab it when you need it, rather than leaving it attached to the seat, which is not recommended. UnbuckleMe is a huge help to grandparents and caregivers with arthritis or those with long nails. Even big kids (think ages 4 and up) are usually able to use it to unbuckle themselves or siblings under a grown-up’s supervision (a game-changer in the carpool line!). Bottom line: Check out UnbuckleMe… your thumbs will thank you.